Rabbi Heschel, a close friend of Rev. Dr. Martin Luther King Jr., knew that freedom and equality did not happen overnight. It would be a long, winding road. At times it would feel as if we were moving backwards rather than forwards, meandering through a dessert of uncertainty. And yet, there was progress being made. This past summer marked the 50th Anniversary of the Selma marches, in favor of allowing all US citizens of color the access to exercise their constitutional rights to vote, and in defiance of segregationist repression. As we know, these marches would prove to be influential in the government’s passing of the Voting Rights Act of 1965. In honor of the 50th anniversary of these historic marches, the NAACP held the “Journey for Justice” this past summer, a 1002 mile march from Selma, Alabama to Washington DC. I was blessed to be one of the thousands of participants. Just like in 1965, reverends, ministers, and rabbis walked hand in hand along activists and people of conscience. We marched in honor of those who came before us. We marched with understanding of how powerful our steps could be. We marched in honor of how far we have come in pursuit of racial justice, and to acknowledge how far we have yet to go. As a child growing up in New York City, we spoke of slavery, segregation, and lynching and Jim Crow laws. We celebrated in the moral courage of Rosa Parks and Martin Luther King Jr. But only later would I learn of the racism that exists today. The father who described what it was like to “the talk” with his nine-year-old son about what he needed to do to stay safe. “You’re male. You’re black. That’s two strikes against you,” he said. The Reverend who shared how her 13-year-old son was brutalized by police for riding a bike in the wrong lane, and who ran away from home, fearful that the police would come back and get him. The mother who had tears in her eyes when she told me of the time her seven-year old daughter was suspended for a week, just for running out of class, away from a bully. “At seven years old, they were treating her like a criminal.” she said. The bright capable college students who were fearful that the color of their skin might get in the way of their lofty career goals, yet filled with determination to not let it. In their stories, I heard frustration and anger. I heard fear and uncertainty. I’m sorry that even after wandering through the desert for decades and decades we have not yet reached the promised land of freedom and equality. I am sorry that it has taken so long for so many of us wake up. I’m sorry that it has taken so many of us so long be present. In Judaism, we there is a tradition of saying “I’m sorry,” acknowledging that only when we humble ourselves and admit our mistakes can we truly move forward. “Sorry” is a beginning, not an ending. Rev. Martin Luther King once taught that the Pharaoh’s main technique for maintaining the Israelites’ status as slaves was to turn them against one another. When the slaves were fighting each other, they had no chance of overcoming Pharaoh’s army. It was only when they united together that they were able to leave land of Egypt, march through the parted sea, and towards the promised land. It is my hope and prayer that we can continue to march together. And that we will march, head held high like Middle Passage, a 68-year-old disabled veteran who despite having five open-heart surgeries, traveled 1300 miles on a bus from Colorado in order to participate in the NAACP’s Journey for Justice, determined to walk every step of the way. Decades earlier he had changed his name to honor the slaves who had been forced to journey through the Middle Passage from Africa to America. He recalled what a blessing it had been to honor their strength and perseverance every time he introduced himself, wrote down his name, or heard someone addressed him. And yet he lived for the future, calling out to children along the march “We are doing this for you, because you deserve better.” They smiled in appreciation. Each day Middle proudly held up an American flag, and set the pace for all the marchers who followed him. He looked out for each of us, alerting us to potholes and uneven surfaces on the road. On the 922nd mile of the journey, sadly, Middle had a heart attack and died. Just as Middle changed his name in honor of the people who came before him, it is our honor to continue the march in his name, to finish the journey that he could not. And we will not be done marching until there are no more stories like those of Michael Brown, Eric Garner, Walter Scott, Sandra Bland, Freddie Gray, and Tamir Rice. We will not be done marching until trust can be rebuilt between people of color and police. We will not be done marching until we are sure that every single child, regardless of his religion, ethnic background or the color of his skin is given the same education, the same job opportunities as any other child. We will not be done marching until we overcome the profound problems of poverty, homelessness and hopelessness. We will not be done marching until parents are longer worried about their children’s safety on the streets of Utica. We will not be done marching until the leadership of the city of Utica, with all of its boards and its mass initiatives are as wonderfully diverse as its population. We will not be done marching until everyone throughout our cities know that black lives matter. And brown lives matter. And Muslim lives matter. And Jewish lives matter. We will not be done marching until my friends of color are comfortable driving in to North Utica New Hartford, or anywhere they choose. We will not be done marching until my white friends feel comfortable driving in West Utica. We are not yet near the promised land, but we are marching every closer. I have hope because of phenomenal initiatives going on here, from the Johnson Center to the Mohawk Valley Anti-Poverty Initiative, to the NAACP, to the great work of wonderful churches like this one, and the list goes on and on and on. I have hope because of the presence in this room even despite the snow storm! As a rabbi, I’d like to think I know a little something about prayer, but I learned more about prayer on the march than I could ever have imagined. Until recently, I believed that Heschel’s words were about action. I thought he meant that he was praying with his feet because he was turning his frustrations and anger into positive, productive action. Now I think that’s only part of it. If Heschel had walked alone, I’m not sure his steps would have been the same form of prayer. Instead, Heschel prayed by being in relationship to others. He was praying because along the march he heard the stories of his fellow human beings. He was praying because he marching alongside his friend, Martin Luther King Jr., with whom he spoke about theology and justice. Martin Luther King Jr spent the occasional Shabbat Friday night dinner at Rabbi Heschel’s home. On occasion he also came over for a Passover Seder. On Passover, Jews retell the story of the Exodus from Egypt. During the Seder we are reminded that the story of the Exodus is not one of the past, but one of the present. What happened in Egypt did not happen at one time: it happens all the time, and is our collective responsibility to overcome the Pharaohs around us, and inside of us. One of the most powerful symbols of the Passover Seder is wine. We drink not one, not two, not three, but four glasses of wine over the source of the Seder. This wine is a symbol of the promises that God made to people Israel: “I will take you out of Egypt”, “I will save you,” “I will redeem you,” “I will take you as a nation.” Wine is a symbol of joy for the great strides we have made forward, and hope for the promises that lay before us. When we raise our cups together, full of gratitude and hope, we transform our space into a holy place, a sanctuary of God. It is holy because of our prayer—but more because of our bond. You see the kiddish prayer is never complete, unless there is someone present to say “Amen.” I believe. Because we’re in this together. Tonight I hold in my hand two cups. They are the very cups that Rabbi Abraham Joshua Heschel and Rev. Martin Luther King once drank from. When they drank from these cups, they created a holy space, not just by virtue of the prayers they offered, but because of their shared commitment to creating a world in which all people could be judged not on the color of their skin, their ethnicity, or their religion, but on the content of their character. Tonight, I would like to call up Reverend Bell to join me in raising a glass of wine. Baruch Atah Adonai Eloheinu Melech Haolam borei pri hagafen. Praised are You, Adonai our God, Ruler of the Universe, who creates the fruit of the vine. As a child, growing up in Brooklyn, NY, I believed that racism was largely a problem of the past. My friends in school were from Poland, Trinidad, India, and Sri Lanka. They were immigrants, first, second and third generation Americans. They were Jewish, Catholic, Muslim, and Hindu. And they loved to tell me about their cultural backgrounds and religions as much as I loved hearing about them. This summer I had an opportunity to understand what she meant. I traveled to rural South Carolina to join the NAACP in just one small leg of their 1000 mile Journey for Justice from Selma, Alabama to Washington, DC. Between August 1st and September 16th, thousands of people joined the march which celebrated how far our country has come in pursuit of racial justice, and to acknowledge how far we have yet to go. When Rabbi Jonah Pesner, of the Religious Action Center, asked rabbis to participate in the march, he hoped to receive one volunteer for each day. Walking 20 miles a day, after all, was no small feat. 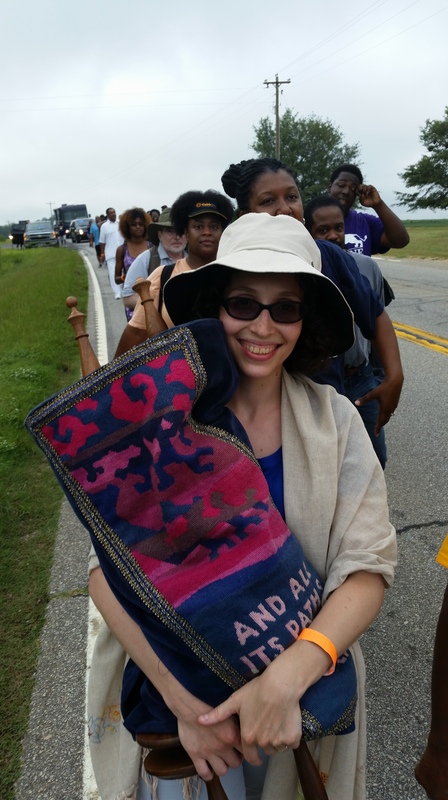 It was his dream that each day another rabbi would proudly walk alongside NAACP leaders, holding a sacred Torah scroll. He was delighted when 200 rabbis signed up. To my delight, I was blessed to share this experience with a member of our community: Cornelia Brown, and two other rabbis from different states. As we walked down route 1, with fields on either side, most people responded positively to our group. There were smiles, thumbs up, honks of support, fist bumps and cheers. Each of them lifted me, and gave me hope. Still, racism was very real. Along the road we encountered a man who made a point of circling around us again and again, with a Confederate flag hitched onto the back of his pick up truck. Another man became so agitated by the sight of the march that he stopped his car, shook his head, looked up, and then floored his car backwards, into a tree. Everyone was okay, thank God, but it was a wake-up call to see how intense racism could be. Baruch Atah Adonai Eloheinu Melech Haolam hameichin mitzadei gaver. Blessed are You, Eternal our God, Ruler of the Universe who strengthens our steps. My steps were strong because of the legacy of rabbis who marched before me. Just 50 years earlier Rabbi Abraham Joshua Heschel walked alongside Dr. Martin Luther King in pursuit of civil rights. But my steps were stronger because of the people I was blessed to walk alongside. One of those people was Keisha. Keisha was surprisingly energetic for her 23rd day of the march. As soon as she heard about the Journey for Justice, she decided to quit her job so that she could walk all of the 1000 miles. But this wasn’t her first time forwarding a message of racial justice. Months later, she would find herself in a coffee shop standing next to a white male who was thanking and praising her for what she had done. As it turns out, he was the son of the man with the Nazi tattoo. He was thanking her for saving her father’s life. I spent much of the march speaking with a white reverend who had three black children. She recalled that she hadn’t given a whole lot of thought to race before they were born. Slowly, she realized that she and they lived in vastly different worlds. One day, she received a call from her 13 year old son. He had been arrested. As he recalls it, the police had pulled him over for riding his bike while black. He was in the correct lane, obeying the rules of the road. But they pulled him over anyway. When he asked them what he did wrong, they refused to answer, so he got up to walk away. They tackled him, arrested him and brought him to prison, on $5000 bail. His mother told me that when he got out of jail, he was different kid. He was fearful. He ran away from home, convinced that the police were coming for him. That is how deep his fear was. His white lawyer told him “Well, none of this would have ever happened if you did what you were told.” His words of hatred would later inspire this boy to become the public defender he never had, but wished he did. The woman from Utica was right. We do live in vastly different worlds. And I am ashamed that I just recently noticed. Racism is so universal and so widespread that to me, it was nearly invisible. Studies show African Americans are more likely to be stopped by the police than whites. And when stopped, more likely to be frisked. And I didn’t notice. In 2010, Justice Department filed and won a discrimination suit against Wells Fargo alleging that the banks had shunted blacks in the predatory loans—subprime loans regardless of their creditworthiness. It was not the only bank to maintain such unethical practices. And I didn’t notice. I didn’t notice that people of color were less likely to be given loans, or to be awarded promotions. I didn’t notice the many poor black communities that fill the US, where students receive inferior educations, and are forced to lower their expectations. And I wasn’t the only one. When we think of racism we often think of men with Nazi tattoos, or confederate flags. We think of members of the Ku Klux Klan or ISIL or Al-Qaeda. But most racism doesn’t come from extremists at all. It comes from the fabric of society itself. And since society sends us constant messages about the inferiority of people of color, and about how we should fear the black man, if we don’t go our way to combat these feelings, racism exists in each of us. Only when we share stories with one another—only when we see the fullness of one another’s struggles can any positive change come to fruition. The Temple in Israel was a holy structure. It’s holiest component was the ark, because it contained the Ten Commandments. Above this ark there were two figures called Cherubim, facing one another. It was a great risk to showcase these figures so prominently. After all, the Israelites had been told not to make any idols, especially after the incident of the golden calf. These figures could very easily be mistaken for an idol. So why did God wish to introduce them? I went on the march because I wanted to do something about racial injustice, but I knew that first I needed to look into the faces of people who were suffering, so that we could come face to face one another in love, embrace, generosity, and care. Each service we read the words of the V’ahavta which tell us to place the words of Torah upon our hearts. Our sages ask why we place them ON our hearts. Why not IN our hearts? And the answer: because sometimes our hearts are closed. We place the words on top of our hearts, and they stay there until one day our hearts break open and the words fall in. Just like the Torah, stories of our fellow human beings lay upon our hearts. We must now crack our hearts open so that they can change us for the better. We must see how our brothers and sisters of color are dying at alarming rates. We must recognize that we have replaced Jim Crow laws with mass incarceration. We must acknowledge that although our country is supposed to be the land of the free, until all people can vote, until people of all colors have the same access to education, and jobs, and security, we are not yet the home of the free. So what do can you do? This afternoon, at 1pm you are invited to reflect on this sermon, and to discuss racism with me, in the back of the social hall. You can be an advocate. Fifty years ago, Martin Luther King Jr. and Abraham Joshua Heschel marched in support of the voting rights act, which took away barriers people of color had to overcome in order to vote. Just two years ago, the Supreme Court undermined that bill, when it ruled that areas with disenfranchisement problems could make changes to election procedures without seeking clearance from the Department of Justice. Supreme Court Judges thought that in 2015, we didn’t need such provisions. But they failed to see just how pervasive racism continues to be. Many communities have tested the limits of the their new power by introducing and sometimes passing restrictive voting laws which have limited citizen’s access to the voting box—especially citizens of color, who are poor, elderly or who are students. Today we are passing out postcards that can be mailed to Congress, in hopes that Voting rights can be reinstated. I encourage you to send them in. We are blessed this year that a student from Hamilton, Lily Wasser, is serving as an intern for the Jewish community. In coordination with leaders in the area, she is helping me to foster productive dialogue between Jews and people of color, so that we face to face one another in love, embrace, generosity, and care. I hope we will have many exciting announcements, and opportunities to participate throughout the year 5776. In this way, we hope to follow the great legacy of Rabbi Bamberger, who worked tirelessly for racial equality in Utica, through the organization Bridge Builders. October 21st is Utica’s Abolition History Day, to celebrate the 180th anniversary of the start of New York State Anti-slavery society. Speakers will include Rev. Robert Williams of Hope Chapel A.M.E. Zion Church, Dr. Kathryn Maria Silva, Assistant Professor of African and African-American History at Utica College, and our very own Mary Hayes Gordon, from the Oneida County Freedom Trail Commission. Flyers can be found the lobby, and you are encouraged to attend. Today we are separated by the color of our skin. We truly do live in different worlds from one another. But when we meet face to face, our worlds will collide, and all of us will be brighter for it. Kein Yehi Ratzon. May this be God’s will. Shirley Chisholm in 1970 said “Racism is so universal in this country, so widespread and deep-seated, that it is invisible because it is so normal. Martin Luther King Strength to Love, 1963. This year I will be less judgmental and more compassionate; less angry and more understanding. This year I will spend more energy with those I love. This year I will be more forgiving and more generous. Kol Nidrei veesare vacharomei v’konamei, v’chinuyei v’kinusei u’shvuot. If you’re puzzled by the words of Kol Nidrei you’re not alone. How can we nullify our commitments before we even have a chance to put them into action? And why would we want to? The Kol Nidrei prayer—the very prayer for which tonight’s service is named—can feel confusing and even counter-intuitive. For thousands of years rabbis have resisted the Kol Nidre. In the 9th century, Rabbi Amram called the prayer foolish, but it was already too much a part of Judaism’s fabric to do away with. Quickly people became attached to the custom, and especially its stirring melody. By the time of Mordecai Kaplan, taking Kol Nidre out of Yom Kippur was sure to upset many people, who like us, are stirred every year by its powerful melody, so he left the melody and took out the words. Other rabbis came up with a different solution: they changed the language of Kol Nidre, so that it no longer discussed annulling future vows, but rather vows from the past, which may have been made in good faith but proved too difficult to achieve. In doing so, Kol Nidre would allow everyone to start the new year with a clean slate. In many communities this change was accepted and proved meaningful, and yet many Ashkenazi prayer books—including ours—retain the original language of the prayer. How do we make sense of it? At one time, historians thought that the Kol Nidrei “prayer” was created in the 7th century when the Visigoths forcefully converted Jews, or in the 14th or 15th century when Jews became Conversos—forced to “convert” and hide their true Jewish identity. We could understand in these circumstances why Jews would want to preemptively annul any vows they might be forced to take in order to survive. These theories are romantic, but they as it turns out, they are inaccurate. In other words we are so scared of not fulfilling our oaths that we begin Yom Kippur with a ritual to preemptively annul them. We are so scared about our imperfections that we are afraid to commit ourselves. We worry what will happen if we don’t achieve our goals. What happens if we fail a test, make a mistake at work, lose our jobs, or if we occasionally lose patience with our child? Most of us beat ourselves up about it with “could’ves” and “should’ves”—sometimes about factors entirely outside of our control—not being at the side of a parent who died without warning, not knowing immediately what was wrong with a screaming child, not being able to help a friend in need. We should’ve. We could’ve, if only we’d known. But we didn’t. I believe that Kol Nidre gives us a powerful tool to overcome this melancholy and grief. That tool is self-compassion. Self-compassion is extending compassion to ourselves in instances of perceived inadequacy, failure, or general suffering. Self-compassion requires self-kindness, recognizing how much we have in common with others, and being mindful. We know what it is to be a good friend. When a friend makes a mistake and apologizes sincerely, we strive to forgive her. When a friend makes a mistake, we offer support and compassion, reminding him that his mistake doesn’t define him, or take away from what makes him so special. When a friend is down, we try to help. But often we don’t treat ourselves with the same kindness. In fact, according recent research, people who find it easy to be supportive and understanding to others don’t offer themselves the same self-compassion. They berate themselves for perceived failures, like being overweight. One member of this congregation told me that she has trouble forgiving herself for mistakes she made when we was 6 or 7 years old. Another told me that when he was laid off, even though losing his job was due to the economy and not his failure, he saw his work status as evidence that he was not good enough. Another rabbi argues that the most important verse states that we are made in the image of God. We are sacred. Each of us as individuals, and all of us, as members of the human race. Yom Kippur isn’t about tearing us down. It’s about building us up. Just as we show a friend compassion, we have the ability to do that for ourselves. When we fail, the goal is not to beat ourselves up but to understand what factors went into that perceived failure. We must recognize that we are made in the image of God, but we are also made of the dust of the earth. We offer the words of Kol Nidre because we recognize that we are human. We are imperfect, and we will make mistakes. We don’t annul our vows to get out of them. We do it to forgive ourselves when we aren’t able to achieve them. Self-compassion sometimes gets a bad reputation for leading to self-indulgence or lower standards. Dr. Kristen Neff explains that is anything but the truth. We hold ourselves when we recognize that everyone makes mistakes. We hold ourselves when we recognize that every decision we made we made for a reason. We hold ourselves when we recognize our capabilities and limitations. We hold ourselves when we recognize where we excel and where we have room for growth. And we hold ourselves when we remember that every action and every decision we have made have helped us to become the people we are today. Now is the time when we consider not the mistakes we’ve made, but why we’ve made them. We work to overcome the root causes for our errors rather than the errors themselves. This is hard work, and we may be unsuccessful at first. Kol Nidre reminds us that it is okay to fail. Annulling our vows means that far more important than the outcome is the effort. All of a sudden making vows isn’t quite so scary. As long as we put our heart into them, succeed or not, we will prevail. Because 5776 will be a year of growth, of improvement, and of increased blessing by virtue of our effort. It is one thing to make a vow at the end of Yom Kippur, but our sages question why we end the Holy Day with this particular vow. Is stealing that prevalent of a problem? The Gerer Rebbe says no. The theft refers to that which we steal from God when we do not live up to our true potential. When we stop trying, when we stop believing in ourselves, when we allow fear of failure to stop us from becoming the people we are capable of becoming, the Gerer Rebbe says we are stealing away our potential. Alternatively, if we acknowledge our limitations, but try to do our best anyway we will uphold our sacred vow. We begin Yom Kippur by giving ourselves permission to annul our vows. We end it by vowing to believe in ourselves anyway. That is the true nature of repentance. Nedarim 23b teaches about an ancient custom allowing people to nullify vows they will make. It does spell out some ground rules, however: they need to have those specific vows they wish to break in mind as they say the prayer, and they cannot teach the rule publically, so that vows aren’t treated lightly. Sephardic liturgy changed the language to say “from last Yom Kippur to this one.” Ashkenazi Jews, such as Rabbi Meir ben Rabbi Samuel (son in law of Rashi), tried to change the tenses as well. They were less successful because at that time everyone was attached to the music and the words. Levine, Baruch. “The Language of the Magical Bowls.” In A History of the Jews of Babylonia. Vol. 5 Ed. Jacob Neusner. Leiden, 1970. “Marx, Dalia. “What’s in a Bowl?” in All These Vows: Kol Nidre, Ed. Rabbi Lawrence Hoffman. Jewish Lights Publishing. Woodstock, VT, 2011, p.26-30. Kook, Rabbi Abraham Isaac; Abraham Isaac Kook; Rabbi Ben Zion Bokser, trans. ; Paulist Press; p102 (“The Lights of Penitence/Orot HaTeshuva”). Lichtenstein, Rabbi Morris; Jewish Science and Health; Society of Jewish Science; p 212. The past several weeks I have debated whether or not to speak about the Iran nuclear deal on Rosh Hashanah. On one hand, I am acutely aware that I am not an expert in international relations, nuclear physics, or national security. On the other hand, this is an issue of upmost importance for us, both as Jews and as Americans. Both sizes of the debate have produced thoughtful arguments for their positions, neither having an exclusive claim to the Jewish communal voice. This morning, I do not wish to convince you that one side is more correct than the other. Rather, I’d like to speak to the nature of the debate itself: something about which our Jewish tradition has a lot to say. I have been incredibly disheartened by the way in which this important discussion has progressed into an outlet of poisonous rhetoric, name-calling and fear-mongering. Some supporters of the deal have made terrible accusations about opponents of the deal—particularly Jewish ones, even when their decisions weren’t primarily out of a concern with Israel. Such opponents have been called “Netanyahu’s marionettes,” “warmongers,” or “traitors.” New York Senator Charles Schumer was subjected to many of these accusations. When he came out against the deal, one website posted a cartoon of a news reporter calling a woodchuck version of Charles Schumer “traitor”, as the American flag in the frame was suddenly transformed into an Israeli flag. Sadly, many others were also accused of dual-loyalty or of being traitors. A CNN reporter made a different and equally disturbing accusation: that Schumer’s motives were primarily economic. He said, “If [Schumer] were to support this deal, he knows it would create a firestorm of opposition, particularly among…. wealthy supporters.” In other words, this reporter didn’t believe that Schumer’s stance on the issue was rooted in careful deliberation or a deep concern for the US, Israel and the world. Rather, he believed that the only possible reason that Schumer could have to oppose the deal is selfish financial gain. It is hard to recover from that accusation with any level of productive civil discourse. The poisonous rhetoric of this debate has not been one sided, either. President Obama has been accused of effectively declaring war on Israel, or of leading Israel “to the door of the ovens,” a startling allusion to the Holocaust. Others have slandered the Obama administration, saying that it had become “the leading financier of terrorism against America in the world,” and that John Kerry was an agent of the Iranian government. As one of the 440 rabbis who signed a note in support of the proposal, I have personally been accused of not being a “real rabbi,” of being a traitor, an Israel-hater, an Arab-lover, and my personal favorite: a Nazi fascist. This use of language is not just unfortunate. It is not just hateful rhetoric spewed without consideration for the people being attacked. It is not just polarizing. It is downright toxic. Whoever said “Sticks and stones may break my bones but words will never harm me” was absolutely wrong. And words don’t just hurt the person they’re used against: they hurt the very fabric of our community, more than we might even realize. Upon hearing this text we might wonder if this was some kind of divine retribution. Was God punishing them for not treating one another with respect? Prolific writer, Rabbi Joseph Telushkin does not believe it was a punishment at all. Rather, it was a “natural outgrowth” of the mistrust that existed between them. When Rabbi Akiva’s disciples stopped having civil conversations, and stopped treating one another with a basic level of respect, they could no longer work in tandem. They lost the ability to cooperate with each-other even when cooperation was needed for their very survival. In other words, because the Jews from Lodz had once been treated with contempt by their fellow Jews from Berlin, they could not bring themselves to trust a German rabbi, even if doing so could save lives. They were so sure that they were right—so sure that they shouldn’t trust the German Jews—so fixated on what distinguished them from one another that they failed to see how much they had in common, something which feels so obvious to us today. They were all Jews, struggling to survive under the Nazi regime. If only they had seen past their differences, how many more lives could have been saved? It is hard to believe that anyone could feel so hurt that they would be entirely unwilling to listen to suggestions of someone wishing to help, especially in these circumstances, but it goes to show how damaging rhetoric and polemics can be. Social psychologist Jonathan Haidt explains how we naturally align ourselves with groups—be they political, religious, or something else. When we agree with our groups we actually receive a hit of dopamine, which can be addictive. We do this because it is so powerful to be surrounded by others who view the world the way that we do: so powerful in fact that we are sometimes willing to adjust our view of the world for the sake of the group. In some ways, this can be positive. We are not solely concerned about ourselves, but rather for the group as a whole. We work towards forwarding the same mission. Even the most intelligent among us are unlikely to recognize that there are powerful, legitimate reasons for being on either side of many current debates, the Iran nuclear deal included. In order to remain “polite” almost every social justice issue on the Jewish scene now has an organized policy to avoid making any stance about Israel for fear of polarity. Congregations all over the country are fearful about engaging in conversation about Israel, Iran, gun violence, and so many issues which are plaguing our community not just on a political level, but on a human one. Think of how much we’re losing by following suit: congregants with a point of view different from the majority, who become less active out of fear of uncivil discourse; people who choose not to engage with Jewish life because it’s not addressing the issues that matter to us the most; Opportunities for new initiatives and events. Even the Stanley Theater refused to host an Israeli-Palestinian band for fear of it sparking outrage, from someone. Friends, I understand why we might wish to avoid debate in a world in which debate can be uncivil and unfair. But avoiding debate altogether has never ever been the Jewish way. We are Jewish. “Two Jews, three opinions” is our motto. We can do better than this! As you may know there were two competing rabbinic voices in the Talmud: Hillel and Shammai. One group said “The law is according to our position.” And the other said “The law is according our position.” God answered saying “Eilu v’eilu divrei Elokim chayim– These words AND those words are the BOTH the words of the living God.” Although they are competing beliefs, they are both right. They both contain wisdom. When will we look at two sides in a debate and realize that we can learn so much from one another? Another Jewish text talks about the nature of controversy. It says “A controversy for the sake of Heaven will have lasting value, but a controversy not for the sake of Heaven will not endure. What is an example of a controversy for the sake of Heaven? The debates of Hillel and Shammai. What is an example of a controversy not for the sake of Heaven? The rebellion of Korach. Korach was a priest, but did not have the social standing he desired. Like a small child he asked “Why does Aaron get to head Priest?” and “Why is Moses our leader?” He sparked outrage amongst the Israelites in hopes of stripping Moses and Aaron of power and claiming it for himself. Korach created a controversy out of his desire for power. Hillel and Shammai debated over a controversy that already existed, in pursuit of answers. Korach had no desire to debate: his mind was made up. Hillel and Shammai approached the debate wishing to learn from one another, and to grow. They debated for the sake of heaven. Korach did not. Amichai wrote this poem around the time of Israeli independence, in a world of great controversy and harsh words, even amidst the excitement of a new state. The poem today can be found near the exit of the Rabin Center in Tel Aviv, as if to demonstrate that the country’s foundation, and its road to peace rests on our abilities to see the humanity, even in our opponents. Amichai underscores the commonalities we all share: the anxieties and concerns we hold, as well as the priorities and loves that matter to us most. What if we approached the topic of the Iran Nuclear Deal with the acknowledgement that although we might come to different conclusions all of us are forming our opinions centered around our a love of Israel, a love of the United States, and a concern for overall safety? “How might things change if we began our political conversation not from our certainties but from our doubts and loves?” How might that have changed our debate? How might that change future debates? In the past several weeks I have been approached by a handful of people wishing to have civil discussions about the issues that so deeply affect our lives. I, myself, have been hesitant to say yes, for fear of an uncivil discourse. Blessed is the One who knows secrets—Blessed is the One who understands that this crowd is filled with individuals, each of whom have their own secrets, uniqueness and individual needs. Blessed is the one who sees these differences as a blessing. Blessed is the one who understands that truth, itself, is multifaceted. We come from a tradition which upholds the beauty of civil debate. And we, too, can choose to model the teachings of Hillel and Shammai, to debate for the sake of heaven. In the coming weeks ahead, I will be meeting with members of the congregation who wish to build a strong foundation for civil, Jewish debate. If you are interested in joining this task force, please let me know; it would be an honor to include you. Together we can create an environment in which we can share our views while inviting in curiosity, collaboration and constructive debate. Let’s make it happen, for the sake of Heaven. Mike Huckabee made this delightful accusation. Perkins, Farady, and Buskey 1991, as quoted in The Righteous Mind by Jonathan Haidt, p. 94-5. God gave Aaron and his sons an important task: they were to protect the holy Tabernacle, and the sacred utensils within. They would be responsible to ensure that the temple remained holy, and the people who worshiped were safe and were inspired. You are responsible, God said, to make sure that immorality stays outside of its doors, and that this holy place remains holy. Well, today, there is no Aaron. The priests of the Temple are long gone. So how do we keep our holy places holy? In the past week, there was not one, but two acts of hatred and violence within holy places of the world. These are the places where people study and worship and console and comfort and celebrate one another. These are the places where people devote themselves to making this world a little better, and a little more inspired. This week they were violated. Who is responsible when a band of Jewish extremists damages a church on the Sea of Galilee because they believe the church is engaging in idol worship? Who is responsible? Surely the perpetrators are responsible; it was their actions. But the responsibility does not and cannot end there. It must also be ours. The Israeli extremists were not just crazy people doing crazy things. Suspect Dylann Roof was not just “one of these whacked-out kids…[not] anything broader than that.” It was something broader than that. Of course it was! Yes, Roof is a disturbed individual, but he is not one of a kind. In a community that proudly lifts up the confederate flag, and names its streets after confederate generals, Roof’s racist beliefs are condoned on a daily basis. This is not the first time a black church has been targeted. It has happened many times before. Roof didn’t enter the church at random. He admits that he walked in to a historic black church, wearing a sweatshirt with a Rhodesia on it, not just because he wanted to kill black people, but because he wanted to start a civil war within Charleston. Tomorrow we’ll read about Korach, a priest who perceived Aaron and Moses as threats with too much power. He responds by trying to spark a civil war of his own, filling the minds and hearts of Israelites with feelings of anger and resentment. Korach’s followers bring their fire-pans and incense to a showdown, insisting God will accept their offerings over the ones from Moses and Aaron. God, who had given Aaron his role as a high priest, and who had made Korach a kind of priest as well, was none too pleased. Even after Korach and his followers lost their civil war, and even after people lost their lives, the Torah teaches something very interesting: The fire pans the rebels used against Aaron and Moses were declared holy, by God. They were not discarded. They were not hidden beneath fire and ash. They were saved, and were treated as holy vessels which the priests would be forced to see and use every single day. They would be constant reminders of the pain of the rebellion of the lives that were lost and of the insidious nature of hatred. Now I know this may be uncomfortable. We don’t want to think about hatred, or the shame and guilt that goes along with the privilege of having lighter colored skin. We don’t want to think any more than we have to about the consequences of racism. We don’t want to want to think about these events too much because they make the world feel scary and painful. They can make peace feel unattainable. But God declared the instruments holy. God declared that we may not forget. We may not put these events from our minds because racism does not stop simply because we stop seeing it. It isn’t enough to say “We’re sorry.” It isn’t enough to say “I’m not racist,” even if we aren’t. We are Jews, or we love Jews enough that we are here today. We know oppression. We know hatred. And we know what it feels like to be deafened by the silence of good people who chose to not raise their voices when they see injustice. We know too well. We cannot discard this story of disgust and put it from our minds. Because if we do, it will happen again. And again. And again. And I don’t want to give this sermon again. Let us instead have conversations about the racism that is such a pervasive force in our country. Let us instead think about what we can do to combat racism. When we hear a racist slur, do we always explain how hateful those words can be? When we fight for the education of our children, are we also fighting for the fair education for all people of all backgrounds throughout our great nation? When we wish to hire someone for a job are we making sure that we are posting the job in places that all qualified people may have access to? Do we notice when we walk into store after store and find that every person in management is white? Are we speaking to our senators and representatives about more racial equality within our justice system, knowing that people of color are far more likely to be put in prison than white people for the very same crimes? Knowing that people who have darker colored skin have a very different kind of relationship with police than those of us who are privileged to look white? We must not be bystanders. We must take action, have a voice wherever we can, because we are responsible. Your voice matters far more than you may even realize. There was nothing holy about Korach’s actions to start a civil war. There was nothing holy about his hatred. But the instruments he used to demonstrate were transformed into instruments of holiness, so that the priests could have reminders of how important it is combat hatred. There was nothing holy about Roof’s racist beliefs, or his violent actions. There was nothing holy about killing The honorable Rev. Pickney, Rev. Singleton, Myra Thompson, Tywanza Sanders, Ethel Lee Lance, Cynthia Hurd, Rev. Simmons Sr., Rev. Middleton-Doctor, and Susie Jackson. There was nothing holy about that. But perhaps if we remember them, if we do not turn away our eyes, and instead recognize and respond to the racism that exists so rampantly in the US—and yes, right here, in Utica—then maybe just maybe we can transform Roof’s hate into passion for justice, and for racial equality. Perhaps we can transform the memory of Roof’s nine victims, who did not choose to die for cause, into fuel to help us create a more holy and just community, both within these temple walls and outside of them. swept away with tides of hatred and despair. Who were powerless in a world of fear. paving for us the path to freedom. Until that day we fast. We fast and we dream. In part my sentiments are family related. The summer offers me more freedom with my schedule, more time to explore through the wonder-filled eyes of my three and a half year old and almost 2 year old. The High Holy Day season is pregnant with emotions and possibilities: to forgive and be forgiven, and to find peace in a world that feels broken– this year more than most. To get in touch with myself and with God, and to let the past go. It also offers the opportunity to start again, to challenge myself to do better and to make this year the most inspired, meaningful and joyous year yet. On the first of Elul, I can no longer ignore the slowly changing leaves. The time has come for this intensive but incredibly rewarding journey. Fall doesn’t wait for us to be prepared. Few things in life do. Ready or not, Elul is here. Bring it on.